Let me introduce you today to a pedal series directly from the U.S. of A. 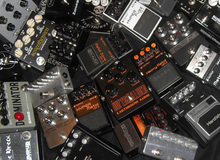 The market of guitar stompboxes is quite saturated — competition is hard, manufacturers fight against each other with new controls and serial numbers. While I was reviewing a Blues 3000, I got the features of my next mission: handcrafted, overdrive, versatility. When I saw these three words together, I jumped into my mustang and headed out west. All experienced fans of long-haired distortion know the famous Soldano SLO-100 made in the 80's: this amp seduced big names in the guitar world — nobody less than Eric Clapton, Mike Landau, Lou Reed... With its mythic Crunch channel, this amp quickly became a reference product in the small electric guitar universe.